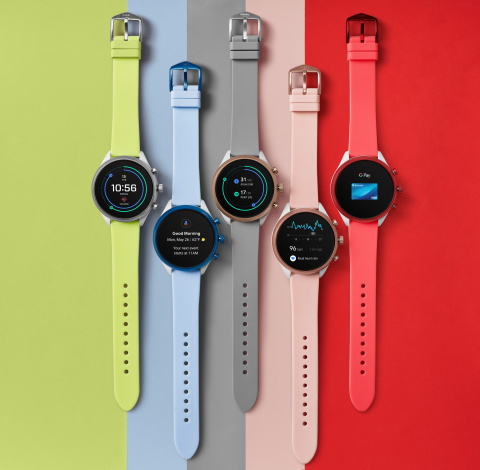 RICHARDSON, Texas--(BUSINESS WIRE)--It is with great excitement that Fossil brand announces its newest addition to our wearables assortment: the Fossil Sport Smartwatch. Based on the recently launched Qualcomm® Snapdragon Wear™ 3100 platform and the newly redesigned Wear OS by Google™, this watch boasts several new technology features including extended battery life, a new battery saving mode, enhanced ambient mode, integrated heart rate, NFC, and GPS capabilities. Thanks to its sleek, ultra-lightweight design, colorful silicone straps, and updated technology, the Fossil Sport is built to be your newest accomplice to achieving a balanced lifestyle for all types of health and activity enthusiasts. Additionally, this watch will be part of a new campaign led by model, marathoner, and entrepreneur Candice Huffine. It is with great pride that Fossil chose Huffine to be the face of this campaign because she has inspired fans by spreading her message of positivity, inclusivity, and empowerment. Not one to back down from a challenge, it was a dare that led Candice to sign up for her first race and embark on a fitness journey that changed her life. As Candice crossed the finish line of the Boston Marathon, she vowed to never tell herself she “can’t” ever again. With an everlasting personal mission to empower women to embrace their authentic selves and love the skin they are in, Candice has combined her two passions of fashion and sport. Candice was a perfect choice as an ambassador for this vibrant smartwatch, and reminds consumers of the message that all bodies are good bodies and everyone CAN! "For several years, the health and wellness industry has been converging with smartwatch technology—and Fossil knew there was a tremendous opportunity to provide a connected option for the design-conscious consumer looking to bring style to their wrist. We know our consumers want versatility both in their activity and their accessories, which is why we wanted to bring a smartwatch to market that is a fit for every style,’’ says Steve Evans, EVP Fossil Group. "We're incredibly excited to be able to offer a colorful sport smartwatch with endless customization and equipped with latest Google and Qualcomm technology for a best-in-class consumer experience." Fossil Sport launches with six colorways, two case sizes (41 and 43 mm respectively), and endless strap options, providing consumers with additional technology in designs and styles they have come to expect from Fossil. The new nylon and aluminum case make this the lightest smartwatch to date and sits alongside 28 new silicone straps to give the wearer endless colorful combinations. Additionally, the Fossil Sport smartwatch will house a bigger battery (350 mAh), and the recently announced Qualcomm Snapdragon Wear 3100 platform, which brings in new capabilities and extends battery life. Utilizing the latest Snapdragon Wear 3100 Platform, Fossil Sport helps customers achieve more than a day’s worth of battery life in the full smartwatch experience, and offers a new battery saving mode that adds an additional two days of telling time. So, whether you forget your charger or just choose to unplug on the weekends, battery saver is designed to stretch your watch battery to last until you can charge again. As software experience continues to evolve, battery life will be further optimized. The Snapdragon Wear 3100 platform enhances the ambient mode allowing for an improved user experience—select dials will leverage the new platform to showcase color and a sweeping second hand for more dynamic style. The evolved Wear OS by Google design simplifies and improves the overall experience. With a quick swipe, users can now access their information faster, receive proactive help from the Google Assistant and get smarter health coaching from Google Fit. Fossil has also created three hero watch faces that integrate Google Fit to show progress towards two new activity goals, Move Minutes and Heart Points, which Google Fit designed based on health recommendations from the World Health Organization and the American Heart Association. Additionally, with integrated sensor processing, heart rate, optimized connectivity, GPS, and NFC capabilities on the platform, the Fossil Sport brings a rich set of features to the market. Rapid charging allows the smartwatch to be almost completely charged within an hour, helping power users from day to night. All watches will come with new applications auto-installed, including leading streaming music service, Spotify, and peace of mind and safety app, Noonlight. With this new generation of watch, Fossil showcases a unique, colorful take on technology and redefining what it means to bring activity and balance to your lifestyle. The added functions will give users a 360-holistic way to track all parts of their lives, while keeping true to the authentic creative spirit of innovative watch design that Fossil was founded on more than 30 years ago. This watch retails for $255 and will be available for purchase starting November 8 on www.fossil.com and in select Fossil retail stores globally on November 12. Android, Wear OS by Google, Google Fit, and other related marks are trademarks of Google LLC. Fossil brand announces its addition to their wearables assortment, Fossil Sport, boasting new technology and ultra-lightweight, colorful design.